26 Apr That’s the Toilet! You simply don’t have a choice, when you’re out in public you are at the mercy of the nearest restroom. The conditions aren’t always ideal and the appliance in question often looks like its straight outta 1940’s Army boot camp. It is what it is, but at home – that’s where you have a say. Your home is your kingdom, it’s where you’re most comfortable, why not make the most of it? You have the freedom to change whatever you don’t like, to make modifications that cater to your preferences. Why not? You work for a living, you’ve earned it. And what is the one spot you are guaranteed to spend time on every day? You might as well make it cozy! And why not make it aesthetically appealing as well? You may not be aware just how much you can actually ‘mix it up’ in this department. Obviously, there’s the generic two-piece toilet that consists of a tank and seat base. The separate sections are built to fit together though there’s a separation between them. This area is prone to becoming icky, and for that reason as a contributing factor, those that can, choose a different model. Such a preferred alternate style is the one-piece. It is chic and refined, elegant in its simplicity. It’s easy to clean and affordable for most budgets. It’s not too common and is deemed to be a luxury of the ultra-modern set. Even so, it is available in the traditional style, too, for those who want the two-piece look minus the nuisance of the additional cleaning. If you are striving to match an established vintage approach, the high-tank toilet will fit right in line. Particularly so of the old-style pull chain models. The tank is separated by a foot or more (alleviating that awkward cleaning dilemma). Generally, they function identically to the previously mentioned models but if you can spend the few extra bucks, you will achieve that desired ‘retro’ feel. From retro to sci-fi, the in-wall toilets are the stuff of space travel. Only the seat is visible, as the tank is concealed in the wall. Presumably, it is preferred by astronauts everywhere (I jest, of course). It is sleek, clean and modern. As such, it will weigh a little heavier on your wallet because it’s not just installation involved, it’s actual messy construction. 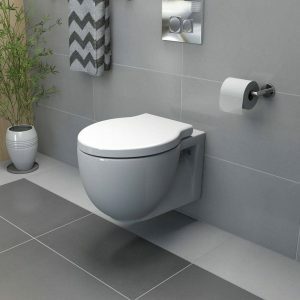 And are you aware of all the variable features you can choose from when it comes to toilet design? 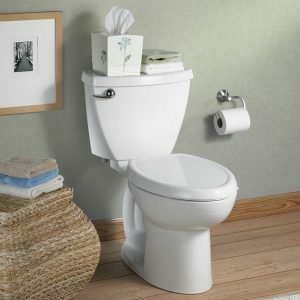 For instance, there are actually different flush types. Among them are ‘gravity-based’ and ‘pressure-assisted’. The former is the standard style that most everyone is accustomed to. 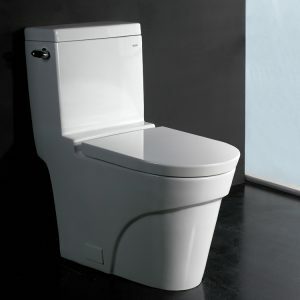 The natural flow of water caused by gravity is amplified with ‘pressure-assist’, creating a stronger and cleaner flush. Another variable worthy of consideration is the height of the seat. The standard is seventeen inches, an inch lower than the typical chair. But for the taller user or those who simply prefer a little extra, nineteen inch heights are available as well. Not many other options here. Giving way to the newer push-button flush activators, the classic lever systems are generally less expensive and still the standard. But more and more people prefer the modern resort feel of the push-button. And the most obvious option, though you likely have never given it much thought, is the color of the ‘can’. We simply have become used to, and thereby accept the standard white porcelain look as the norm. But there are many colors to choose from. You can even be creative by combining, say, a white lid with a black base. Or if you’ve designed your bathroom in pastels, you’ll probably want the unit to reflect the preference. Possibilities abound. Maybe you tire of the hard surface and wish for a cushioned seat in its place. Can do! You have the freedom and the power to deviate from the norm, many styles and colors are offered in the hopes of appealing to your specific taste. Take advantage!